Strange Aeons 2nd Edition KICKSTARTER!! Strange Aeons is a thrilling miniature skirmish game set in the 1920s and populated with the weird denizens of the works of H.P. Lovecraft. Designed for use with 28-32mm scale miniatures, each 2-player match of Strange Aeons plays in 30-60 minutes and requires only 3-10 models per player. And with a standard board area of just 2’ x 3’ (approx. 60 x 90 cm), all else you need to play is some six-sided dice, a tape measure, a kitchen table and a box of scenery. The new edition of Strange Aeons will be at least 180 pages long – more than double the size of the 1st Edition! And this is almost entirely game-usable content. We plan to include a section outlining the history of the Threshold Agency, and possibly some additional ‘flavour’ content via stretch goals, but apart from these elements, the book will be all meat, no filler. While we’ll be redesigning the interior of the book completely, we’re sticking with the size and format of our very well-received 1st Edition: full colour throughout on sturdy paper, with a heavy cardstock cover and our signature coil binding. Also, we’re maintaining our high standard for interior art, with contributions from Riley Rossmo, Toren Atkinson, Matteo Bocci, Mike Perry, Brant Benoit, Melvin de Voor and comic legend Nat Jones (Death Dealer, ’68), whose work also appears on the Kickstarter-exclusive Bookplate we’ll be including with every printed copy of the Rulebook. Along with the revised rules, we’ve revised our miniature line. All of Uncle Mike’s unpainted 32mm resin figures are produced in-house, allowing us to keep a close and personal eye on the quality of every figure. Sculpted by an extremely talented crew, including Kyla Richards, Justin McKenzie, the legendary Bob Murch, Iain Colwell and some pieces created by Uncle Mike himself, our model line has come a long way since its 2009 inception, and we believe the new models we’re offering in this campaign are our strongest ever. As the campaign progresses, new Boxes and Boosters will unlock as Stretch Goals, and new models will be added to existing Boxes and Boosters as free Upgrades. And remember, you can also always pledge additional amounts over and above your base pledge level if you want to add more Boxes or Boosters than the pledge includes. We have an exciting range of goodies lined up that will become available as the campaign progresses. Stretch Goals come in the form of additional Boosters and Boxes – which will become available for sale as they unlock – and Upgrades, which are FREE additions to existing products. Don’t just take our word for how great Strange Aeons is. Check out these external reviews and gameplay videos, complete with Uncle Mike interview (thanks to Geek & Sundry’s Teri Litorco for letting us post these, and for being such a great supporter of our game)! While all these reviews apply to the 1st Edition of the game, the core mechanics are very much the same, and the quality of the components will be up to the same standard we have always maintained. We’ve also had printed reviews featured in The Ancible (#5), Amazing Figure Modeller and Wargames, Soldiers & Strategy (#56). Additionally, you can check out Strange Aeons’s listing on BoardGameGeek, where we have an average score of 8.2 (very good for a miniature game! ), or join discussion of the game (in which the UWM team regularly participates) at Lead Adventure Forum. With five years of experience – encompassing five books and a plethora of miniatures and accessories – under our belts, we have a tried and tested system in place for producing all the elements of our game. We manufacture our own miniatures, and have a long-standing relationship with a local printer that has always provided us with top quality at lightning speed. Even our t-shirts are produced by a local supplier, so we have only a handful of stretch goal products (mainly game aids) that we plan to outsource to manufacturers outside our immediate sphere. These well established practices and relationships mean we’re far less likely to encounter any surprises in the manufacturing process, and we have good communication and relationships pre-established to sort out any issues if they do arise. The only real difference this Kickstarter-based approach will present is volume. Depending on how successful the campaign is, we may find ourselves faced with producing and distributing goods at a scale we’ve never attempted before. We’re confident our partners are up to the task, and Uncle Mike stands ready to upscale his miniature manufacturing output as circumstances demand. While this is new ground for us, we’ve been doing our homework to learn what the best practices are for us to follow in order to have a success of our own and, even more importantly, happy backers! This is one of the reasons we’ve set a target delivery date of August 2015. While we’d love to get everything out sooner, it’s best to be realistic – and then add even a bit more beyond that – as we’d much rather be on target than delayed, and have pleasantly surprised backers instead of grumpy ones. Rather than cut straight to the chase and post up some cut and paste army lists, I’m going to take some time to run through the new Codex Eldar units and see what they have to offer. There’s a lot of information to process, so the second half will come later in the week. I might even get my friends Steve and Jordan to suggest some starter armies based on their expertise and experiences. The Farseer — Still the auto-include he once was? For army-wide special rules, we have Battle Focus and some grudge match rules versus Slaanesh. Battle Focus is amazing, allowing you to run and shoot or shoot and then run with most of the infantry models in your list. Even War Walkers get it! In most game systems, being able to move twice is a huge bonus. Just ask anyone who has run into X-wing’s Turr Phennir how much fun it is trying to catch models that routinely duck outside of range immediately after they blast you. When facing Slaanesh, Eldar are at -1Ld but benefit from Hatred in combat. This rule is pretty awesome, being very fluffy while Hatred does help (somewhat) to balance out the penalty. Spiritseers and Warlocks, being Ld9 and Ld8 respectively, will be pretty unreliable against Slaanesh, which makes sense given how terrified they would be of having their souls devoured. Speaking of these psykers, let’s start the breakdown with the HQ options. With all their psyker wargear shenanigans and the army’s dire need for re-rolls, fully equipped Farseers were simply a must and Eldrad was found in more places at once than Erebus from the Horus Heresy books. Seriously, that dude was all over the place. There are now multiple viable choices for HQs, as Spiritseers unlock Wraithguard/Wraithblades as troops, Autarchs have more gear to choose from (and allow you to fudge reserve rolls), and the Avatar is a bit more beastly, while still significantly buffing foot lists. Even before you get to the rest of the list, you can see there’s a lot more internal balance than before. As is always the case with HQs, you just need to think about what role he is playing in your army, plan accordingly, and try to avoid over-spending. Naked Spiritseers or Farseers with a bike and Singing Spear are pretty straight forward, the Avatar remains a solid buy in an infantry list, while the Autarch remains a bit underwhelming it seems. Aegis/Comms Relay is a cheaper way to modify your reserve rolls, if that’s what you’re after. When it came to Troops, a lot of folks were worried that Guardians would become the cheap, spammable objective campers (aka Chaos Cultists) of the Eldar codex. Instead, we see a rebalancing of the Guardians and Dire Avengers, where the former get a lot more offensively capable (WS/BS4 and I5) and the Avengers are no longer a one-shot wonder with double tapping Bladestorm. Both units have decent damage output via the new Bladestorm rules affecting all shuriken weapons (which is essentially Rending Lite vs. non-vehicle units), and it’s their other skills that differentiate them. Guardians get weapons platforms and can be joined by Warlocks, while the Avengers have more range and some defensive powers to choose from. Both can use Battle Focus to run and shoot (or shoot and run), dancing around the enemy’s effective ranges and jumping into/out of cover as needed. Combined with Fleet to re-roll the run distance, this is a very interesting tactic for them to strike and fade, mitigating the disadvantages of having such short ranged guns. I definitely think Dire Avengers got a lot more interesting (and don’t require a Farseer/Serpent to make them useful)… however, they did also get hit hard by the new pricetag for the box. With only 5 per box, they almost cost as much as when they were 10 per box. That’s pretty terrible, but hopefully most Eldar players have a unit or two from before. Rangers are also an interesting choice, as they are very cheap little snipers with Stealth who (if you take the sniper special character, Illic Nightspear) can be upgraded to pricy but nasty Pathfinders, adding Shrouded and the ability to always allocate precision shots. Holy balls, that’s a lot of wound allocation shenanigans. Thankfully this is a very substantial points increase, so spammy Alaitoc armies won’t be annoying as they were in 3rd edition. Still, these guys will remain an effective, cheap, objective camping utility unit. As discussed with friend and 40k goon Jordan Murphy, a lot of armies now have ways to negate uber cover saves (Tau markerlights, flamer/torrent weapons, Sternguard rounds, Thunderfire cannons, Perfect Timing from Divination…), so that’s their biggest weakness. Finally, you also have one easily overlooked unit, the humble Guardian Jetbikes. These guys don’t benefit from the Battle Focus rule (although Eldar jetbikes can still move in the assault phase, so who cares? ), but they did get a hefty points drop and gain the Bladestorm rule for a bit more shredding infantry. Oh yeah, and they share the Guardians’ stat boost too. Jetbikes used to just hide in reserve and turbo boost to objective camp late in the game. With a points drop and offensive boost, they can do the old job for less or they can actually be made into mainstay units that participate fully in the battle (heresy, I know!). If these guys ever get a new model, they will be incredibly popular. Even without a new model, the rules make them a very tempting option to theme your army around. I guess we should be grateful the repack of the old models made them a bit cheaper. It’s not too often that you can say that. There is way more here than there used to be. Spiritseers are HQ (similar to a mini-Farseer in terms of casting ability), and not just Warlocks who babysit Wraithguard. They also can make your Wraithguard and Wraithblades Troops. A Wraithblade unit with axes/shields can be decently punchy when given a few psychic buffs (Fortune helps a lot for re-rolls). Lack of speed is the big obstacle with them, as the units can’t go in a Wave Serpent. The sword variants are fairly punchy, but lack any kind of Invul/FNP save, so they are definitely more fragile. When it comes to the shooty Wraithguard, the Wraithcannons and D-scythes both have strong pros and cons. If paying the extra cost to take D-scythes, which are essentially AP2 flamers that penetrate vehicles and cause Instant Death on a 6, they will want a Transport to get them in position to delete an important enemy unit. All in all, you have four good choices for some durable Troops that are a decent offensive threat as well. Wraithlords and Wraithknights appear pretty solid. Dark Eldar and other armies with poisoned attacks laugh at their T8, but they can still disrupt the plans of rank and file enemy troopers (who simply can’t hurt them). Cost is the big thing here, as they go up very quickly with upgrades, so keep them cheap and support your Troops by drawing away enemy firepower and you should be fine. Also, remember that Wraithlords are characters, so in melee there will still be challenge shenanigans. For equipment, dual flamer and Ghostglaive should be plenty on the Wraithlord. Taking more than two weapons is questionable, as they can only fire two per shooting phase anyway. The Eldar aspect shrines got a lot of changes; for example, Banshees now penalize the opponent’s Initiative score rather than striking at I10 themselves. Fire Dragons lose Tank Hunter but gain 3+ armor, Scorpions gain a full suite of Stealth, Move Through Cover and Infiltrate, Dark Reapers are Rlentless and can buy Night Vision, etc. Some of these units are still going to be tricky to use, but you can be sure that Swooping Hawks will be popular for their cover save ignoring grenade packs and S3 AP5 Assault 3 lasrifles, and Warp Spiders are still going to be a beloved unit for many with their high damage output and insane mobility. Their Exarch can also be particularly deadly. Shining Spears, being one of the only fast assault units in the book, will also serve a purpose for folks who know how to use them. Aspect Warriors will be great for plugging gaps in your army list. You don’t need to spam a whole bunch of them, but take a few to shore up whatever aspect of your army you are worried about. Still to come, an overview of the vehicles and flyers. I’ll post it up later in the week once I have had more of a chance to look up what the various ugrades do, how much things cost, and all that lovely stuff. Hobby Health Vlog from Thatterigirl! One week after the 6th edition Tau book has been released, there’s still a frenzy of analysis and speculation about how the future looks for this fledgling empire. I joined Lange and Matt for episode 123 of Jaded Gamercast on list 6th edition Tau list building, and doing the show is always fun. Drinking and getting belligerent is fine, but doing so with an audience is even better! Seb’s Tau Cadre, pic from his post on the Advanced Tau Tactica forum. We didn’t talk about everything in the list, but we tried to get through a few notes on how to set up the core of an army, and what roles certain units can fill within that framework. Here’s a slightly less entertaining but hopefully somewhat informative breakdown of the codex units and what they will do for the army. As I tried to explain on Jaded Gamercast, with limited success due to the Grey Goose, I feel most armies will be built around a core of 1-3 Riptides for most of the heavy lifting (~200 each), 2-4 Fire Warrior Squads (~100 each), a couple of Pathfinder/Kroot infantry units for support (huge points range depending on unit size and upgrades). This can usually be filled out for around 1k points. Once this core is filled out, you can season to taste with more support units and tank/aircraft hunters. HQ choices also offer a plethora of combinations, such as Commanders stocked with support and signature systems for a pile of special rules, or the cheaper Ethereal and Fireblade alternatives to buff your infantry gunline. Personally, I’d want to try a Commander with Iridium Armor and Drone Controller leading a unit of Marker Drones. This could provide the toughness and reliability Pathfinders sometimes lack due to being BS3. Give him a Target Lock and a ranged weapon and he can take potshots at separate targets (if needed) while the drones provide a steady stream of Markerlight hits. Shadowsun is also a really neat option, as she has Stealth, Shrouded and Infiltrate to give to any squad she joins. She also has some cool experimental drones (improved 3++ shield drones and one unit within 12″ can re-roll 1′s to hit). This allows her to combo-up with various units, giving them better deployment options, accuracy and survivability all in one neat little package. As Broadsides are looking more and more like a S7 spam unit rather than the old S10 AP1 Land Raider killers, I fully expect to see a few Hammerheads with Railguns and/or various units with Fusion Blasters to pick up the slack. It might not always be advisable, but the Riptide can overcharge/nova reactor his Ion Accelerator for some S9 ordnance action, so he can definitely help if you’re truly desperate. Overall, many units and combinations of units will remain viable in the new book. As we mentioned in the podcast, the humble XV8 may be one of the only units left in the dust, as these generalist support squads are now competing with Riptides and improved Stealth Suits for space in the force organization chart. If you are taking them, they need a specific role or they may just be wasted points. All those Deathrains from 4th and 5th will struggle to out-shine missile spamming Broadsides. IMO, the Fusion Blaster is their best bet for finding a purpose, as that extra 6″ range boost they got makes them a lot more dangerous. With Broadsides’ Railguns no longer plowing through AV13/14 targets with ease, having a throwaway Fusion delivery mechanism might come in very handy indeed. The other option for making XV8 work is obviously Commander Farsight with his up to 7 Bodyguards. Despite the horrendous points cost they can form a pretty nasty deathstar, deep striking with no scatter and attacking multiple targets at the same time via Target Locks. With a full complement of support/signature systems buffing the unit (hit and run, re-roll misses, ignore cover saves, etc. ), they will be hitting very hard without reliance on Markerlights or other support units. Best of all, they don’t take up that precious Elites slot. For a regularly updated painting blog from an Alberta local Award Winning painter check out Mini Junkie! Originally posted by Jarrett Lee in 3 separate posts. Hey gang- sorry for slow rate of updates – I’ve been a bit depressed lately (candidly) which has lead to me sitting down at the painting table, looking at it, and doing nothing. I mostly just focus on work and playing League of Legends lately. Sitting at a desk so much my shoulder has been hurting (bad ergonomics maybe). Sad state of affairs. I have 5 Dark Angel Deathwing Knights in progress but stalled on them a bit. I do think I’ll get back to them though, the models are so good. 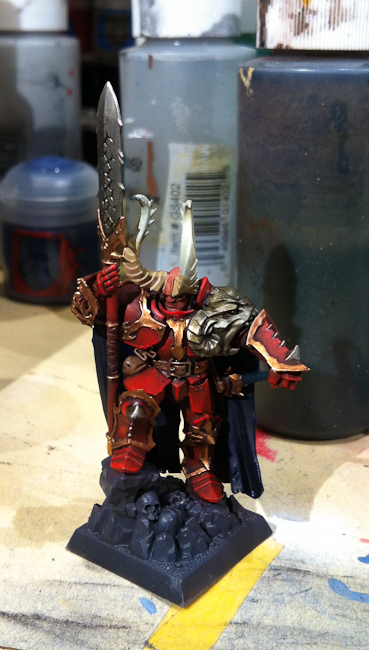 That said, today I decided to tear into one of the new Chaos releases – the plastic Chaos Lord. In my opinion this is one of the coolest models in the release, along with Throgg who I also bought (and have primed). At first I didn’t feel like I could get this guy started, but today I just pushed through the inertia and got some paint on him. Still work to do of course – the cape hasn’t been touched other than a base coat of Necron Abyss. Face and horns are just base coated as well. The armor is looking a bit flat to me as well so i need to look at maybe adding back some shading to the red areas. Finished this guy up tonight. 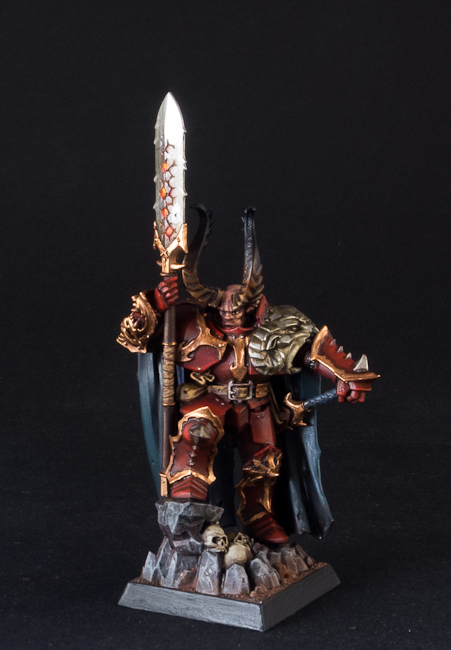 I’m reasonably happy with the final results – his face could use more definition and I could certainly stand to dust/clean my photo backdrop 🙂 Definitely a nice miniature to paint, I enjoyed it and may try another one at some point. …and this issue –unlike the last two– arrived right on time! 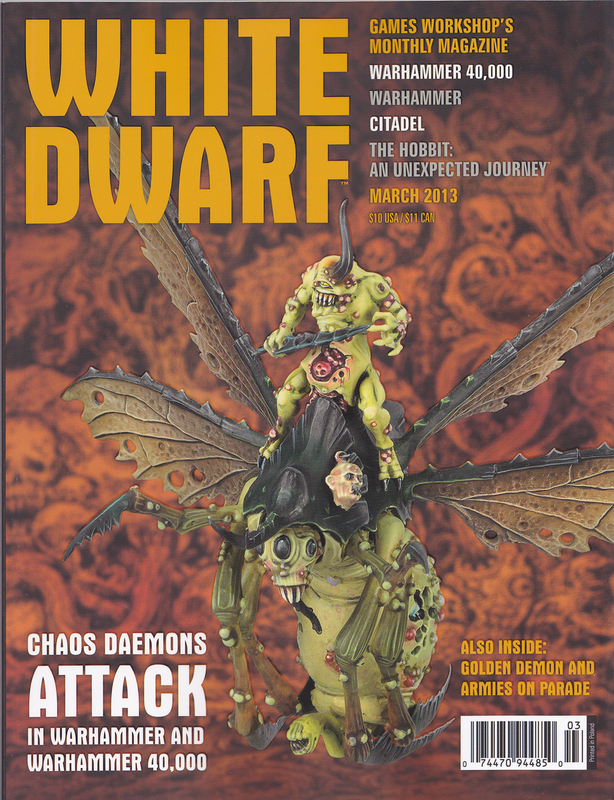 As is the new reality with the White Dwarf, the figures shown on the cover denote what the current month’s issue focuses on. This month, it’s demons Daemons. This issue is the second in a row for “the new ‘Dwarf” to come poly bagged despite there being no “extras” included with the issue. Inside Cover: The White Dwarf Team. Page 1: Opening Salvo: Jes Bickham’s editorial. Double-dip month! Daemons for 40k and for Fantasy! …plus they have some birthday celebration ideas in mind for next month’s issue –perhaps something extra to include with the magazine, thereby warranting poly bagging the future issue? Pgs 2-3: Table of Contents: Break down of this month’s issue. Pgs 6-7: New Releases: Epic gate-fold pages shows off a giant Daemons army while the “magazine side” talks about the Plague Drones of Nurgle. Pgs 8-10: New Releases: The Burning Chariot of Tzeentch. Cool enough model….but probably not cool enough for it to sell. Page 11: New Releases: The new Herald of Tzeentch (on a chariot) makes me think it’s just a set of alternate pieces inside the Burning Chariot kit. Pgs 14-15: New Releases: The Skull Cannon of Khorne. Two Bloodletters stand atop a Khorne-plywood sheet , manning their toothy version of a pirate ship deck gun, all done while cruising around on an awesome manga-motorcycle that’s driving backwards. At least that’s what it looks like to me. Pgs 16-17: New Releases: The new FINECAST(TM) Herald of Nurgle. After seeing the Heralds of Khorne and Tzeentch, it looks like Nurgle players are getting the short end of the stick with this release. Good. 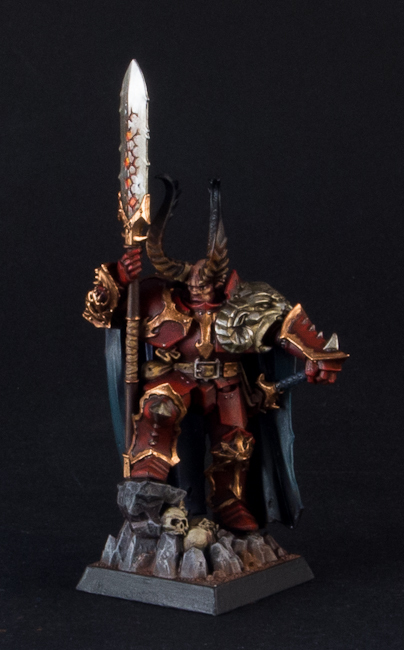 Pgs 18-19: New Releases: A second Herald model for Khorne! Does this mean the Khorne daemon rules are so spectacular that GW projects Khorne stocks going up enough that model sales will follow? Page 20: New Releases: The new Herald of Slaanesh. This looks to be an awesome plastic kit ….unless it’s in fact a FINECAST(TM) model, in which case this is GW completely NOT making a model that embraces the resin medium’s advantages over the plastic and metal mediums. Page 21: New Releases: Battleforce/Battalion box, the Battle Magic and Psychic Power decks for Daemons in Fantasy and 40k. Nothing to read here; move along, move along. Pgs 22-27: New Releases: The cover paintings to the Daemons Warhammer Army book and the 40k Codex, followed by two pages dedicated first to the fantasy book and then again to the 40k book. Pgs 28-29: New Releases: The Hobbit: Dwarf Warriors of Erebor. These are nowhere near as awesome as the Dwarf Grim Hammers from last month. I wish I could be more excited about the Hobbit range, but GW seems set on making the line bland and pricey: $40 for 12 single-piece plastic models? No thank you. Games Workshop, you can charge me the $44 for ten Space marines because I can build/pose and equip them as I see fit (and with bitz left over! ); these Dwarves offer me none of that. I sometimes feel like GW is running with the Hobbit license just so that no other company can. Page 32: New Releases: The Hobbit: Dwarf Grim Hammer Captain. 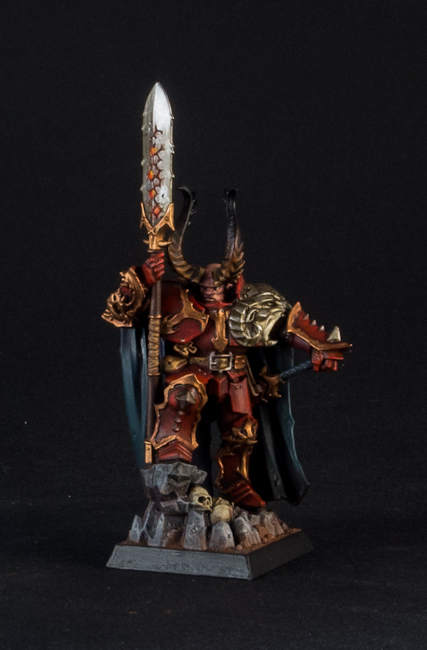 He doesn’t look as cool as the regular rank-and-file Grim Hammers …and, being made in FINECAST(TM), he also clocks in at half the price of the whole box of Grim Hammers. For one middle-of-the-road model. I say skip this one. Page 33: New Releases: The Hobbit: The Dwarf lord, Thror. Despite being set at the FINECAST(TM) price point of $25 for this single model, at least it’s cool enough to tempt me. He really is cool. Page 35: New Releases: The Hobbit: An Unexpected Journey hardcover rules manual. WTF??? THIS IS NOT NEW! I suspect that the sales of this are SO infernally dismal, that Games Workshop has been left wondering if they forgot to advertise its availability back when it came out before Christmas. No, GW, you didn’t forget to mention the existence of this rules manual; it’s just that people know when they’re getting hosed. 40k players take note!! Next time you’re going to grouse on about what a raw deal the 40k rulebook is at $90 for 432 full-colour pages; THIS is what getting hosed is: The Hobbit’s rulebook is $100 for 288 (full-colour) pages. But GW can’t figure out why it’s not selling, so they list it as a new release …again. Pgs 36-37: New Releases: The Hobbit: An Unexpected Journey Escape from Goblin Town starter box. OR PERHAPS the game hasn’t come out yet! OR PERHAPS I’ve gone back in time and am reliving the world as it was three months ago. …Or more realistically, the writing’s on the wall, and we have front-row seats to see just how well the Hobbit game is performing for Games Workshop. Despite my absolute love for all things genuinely Tolkien, and my persistent desire to want to like GW’s Hobbit range, I can’t. Pgs 38-40: New Releases: Black Library: Death of Antagonis, a novel about one of the 13th (“Cursed”) founding’s chapters, the Black Dragons. Remember back when White Dwarf published rules to make your very own game-legal Cursed Founding chapter with its own special traits / abilities? Probably not. But I digress; hot on the heels of the Path of the Renegade novel comes Path of the Incubus written by none other than Andy Chambers! …who always struck me as a rules writer, not a prose writer. Also out this month: keeping with the Daemons’ double-dipping theme in this month’s magazine, The Masque of Vyle is a second Eldar novel (okay–it’s a novella) out in March. Lastly, for Warhammer, comes Van Hortsmann and has the tag line “Egrimm van Horstmann is the most promising wizard the College of Light has ever seen, but he harbours a terrible secret.” I’m betting it’s that “Freaky Friday” mirror of his. Just sayin. Page 41: New Releases: Digital Products: Buy the White Dwarf issue you’re currently reading, the Daemons codex / Army Book –heck, even the 40k Psychic Powers are all available in digital format! Pgs 42-43: New Releases: Forge World: More Warhammer 30k models: Terminators for the Death Guard and the Sons of Horus that both look like space marines in Mk VII armour that have let themselves go a little bit. Rounding out the releases is the Vulkite Caliver upgrade pack….whatever those are. Pgs 44-45: New Releases: Licensed Games: And by licensed, they mean iPad games. Warhammer Quest comes out in March for the iPad! Also coming down the tubes is the next battle pack for Warhammer Invasion by Fantasy Flight Games. Pgs 46-47: New Releases Summary: Full listing of this month’s extensive releases, complete with prices. Pgs 48-49: Advert: GW Online Store. Surely, after the whole “we own every use of the words Space Marine” debacle, ‘Workshop has proved they firmly believe there’s no such a thing as bad P.R. …Which makes me wonder why they don’t mention in this advertisement that Games Workshop Online carries items (such as the Death From the Skies supplement) that aren’t available from GW Hobby Centre Retail stores –and they won’t let independent stores order or carry. 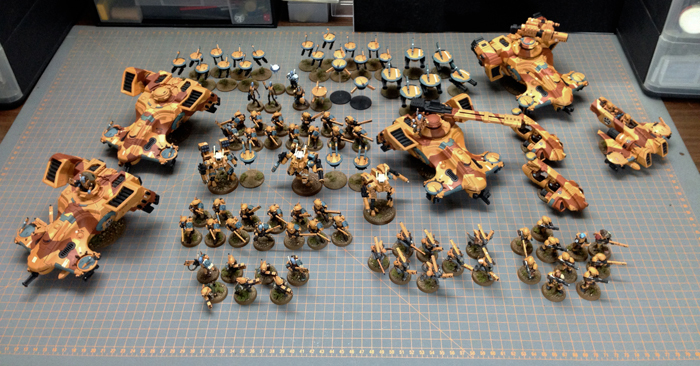 Pgs 50-55: Army of the Month: Dave Roberts’ Lamenters Space Marine army. One day I will chart how many Marine armies (versus anything NON marine) get featured here. Pgs 56-57: Standard Bearer: Jervis tackles how to solve perplexing rules questions. He admits that designers don’t always know how their games will always play out …and then goes on about how normal and acceptable and just generally how good it is to just rely on a random dice roll to solve those tricksy rules dilemmas. …Which makes me wonder if this solution hasn’t also been applied to other facets of Games Workshop’s business. **I have no proof this conversation ever actually took place in a GW executive meeting. Pgs 58-73: Battle Report – 40k: Daemons of Chaos piloted by Adam Troke take issue with Matt Hutson’s Imperial Fists. I think I’m more concerned with how Daemons do when up against another sixth edition (or even a late-fifth edition) codex. But what I’m REALLY curious about is how stacked the odds are against the Daemons when they rook up against Grey Knights. However, this battle report tackles neither of those issues and instead goes after the vanilla marines. The Imperial Fists lose their battle as a result. In hindsight, I’m finding that I kind of wish they’d list the points values of the armies in the battle reports. Pgs 74-77: Blanchitsu: John Blanche shows off some models that a fan sent him. The models look like Mr. Blanche himself did them –and the accompanying portraits of each model in the Inquisitor warband look even more like paintings done by John Blanche. I wonder: when John Blanche talks about playing games with the inquisitor warbands he paints up (or in this case gets sent by a fan), what game is he playing? The old Inquisitor game? I’m truly curious. Pgs 78-79: Hall of Fame: Urien Rakarth. I would argue that inducting models barely three years old into the “Hall of Fame” really makes the hall of fame feel not all that prestigious. Pgs 80-95: Parade Ground: UK Golden Demon, 2012 …part 3: Despite the quality of the entries, having a third installment of Golden Daemons models makes me suspect that the magazine in general is starved for good content ideas. I’ll say nothing else negative here as the entries are truly inspiring (all except the Space Wolves ones…just because, well, Space Wolves). The Nurglish Ettin on page 95 is absolutely breathtaking. Pgs 96-101: Kit Bash: The “secret ingredient” this month is Warhammer 40,000 Ork Fighta Bommers. And every model is awesome! I should go on at length about these, but the words will do the models no justice. Pgs 102-109: Battleground: Coverage of the best entries from the 2012 Armies on Parade competition at the UK Games Day …again. All four are superb. Three of the four are mostly yellow. A repeat of last month’s topic again leaves me thinking the ‘Dwarfers are stretching one article across multiple months in order to bide time. Only one Marine is showcased here, and it’s truly good to see some Tau! 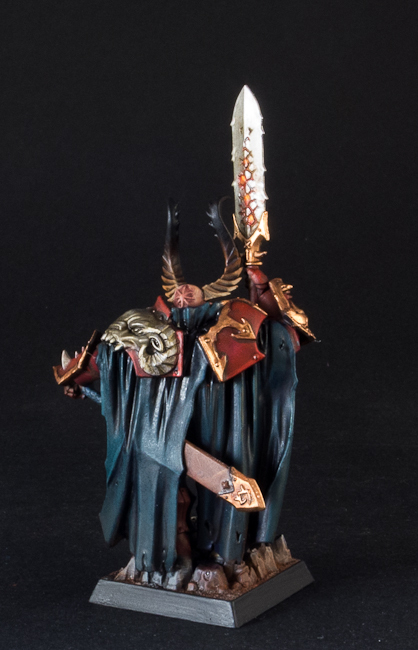 Pgs 110-117: Paint Splatter: How to go about painting up all your Daemons stuff. Warriors of Dale are then touched upon, before this segment then moves on to painting using a GW spray gun, featuring Matt Hutson’s yellow Imperial Fists. Pgs 118-119: Jeremy Vetock: A list of things Jeremy Vetock doesn’t like. Overall the article is pretty innocuous, in all senses of the word. I’m kinda’ holding out for Jeremy to hit his stride with this column. I mean, if Jervis brings game design (if you will) to the table, and John Blanche brings art design, what niche can Mr. Vetock fill? I know I’d like to see less “opinion of the minute” columns from him and maybe more about the various campaigns/leagues he’s run over the years –heck even if his column tackled designing satisfying campaigns every now and again, that would be pretty nice. Pgs 121-124: Advert: Games Workshop Hobby Centres! Also: GW Hobby Centre “birthday” celebrations & upcoming giant games at the Memphis battle bunker. Page 125: Advert: GW advertises that their products are carried by independent stores, and encourages YOU to encourage your local store to carry GW products. Pgs 126-135: Advert: Listings of GW Hobby Centres (worldwide) and GW Independent Stockists (North America). Page 136: Advert: White Dwarf suggests you consider having your White Dwarf magazines mailed to you every month. -White Dwarf: Details about “The Hobby Challenge” laid down by Matt Hutson: to paint up a new force and battle with it before next month’s White Dwarf. By the sounds of it a “force” is roughly a battleforce-box amount of models (more or less). All three games systems will be represented. -The Design Studio: John Blanche talks about the history of the chaos powers –from a codex point of view. Aly Morrison, Colin Grayson, Dave Thomas and Mike Anderson all talk a little about the daemons models they’ve sculpted for this month’s releases. Then John Michelbach talks about the map he made detailing the realm of chaos itself. -Around the Studio: Snapshots of some projects belonging to non-White Dwarf studio staff. The Nurgle-themed Chaos Marine army is the one that truly stands out. -Forge World: Shots of more 30k models, the Minotaurs chapter Sternguard, two half-finished orc character models and another new tile for the Realm of Battle board, this time Fantasy themed. -Black Library: Ben Counter talks about his new novel, Van Hortsmann. Also snapshots of models inspired by some Black Library releases, all of them space marines. Page 152: Parting Shot: If last month’s parting shot picture of the Necron flyer could be seen as heralding the Death From the Skies 40k supplement, I really do wonder what a picture of Space Wolves on their Thunder Cats Cav fighting a Tyranid could possibly portent. Perhaps Workshop has pulled the wool over everyone’s eyes and is about to release a new Tyranid codex? Probably not. Still…. Inside Back Cover: March Events Calendar: I very much enjoy how this calendar also includes February 23rd –when the advance orders for all the early March releases first go up on GW’s website. Just seems kind of redundant to me. I don’t know what’s up with this issue. I think, for the most part, I liked last month’s issue (especially the irony of Jervis Johnson speaking against the homogenisation of the hobby while working side-by-side those whose goal is to homogenise the Warhammer hobby! ); and yet, this month’s ‘Dwarf has left me feeling, to be blunt, a bit pissed. 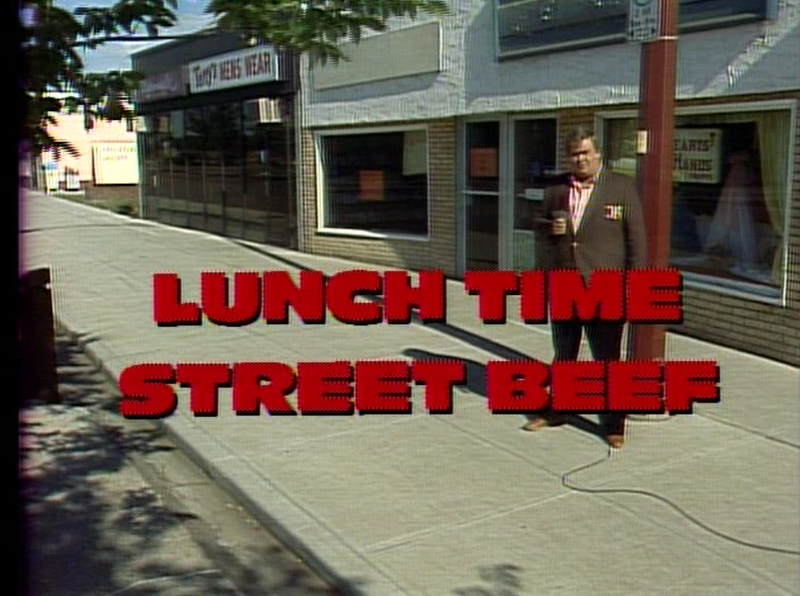 Beef #1: For the second month in a row, this issue came poly bagged –despite the utter lack of anything extra being included with the magazine to make poly bagging it a necessity. Then there’s what has transpired in the last month: Games Workshop deciding that the term Space Marine has never existed prior to 1989 and the advent of Rogue Trader (I tell you, it’s a good thing Tolkien has such good, long-serving lawyers…otherwise Amazon might be considering yanking Tolkien’s books too!). BUT, too many people have written about this already, so I’m not going to say much more. Lastly, there’s the GW’s handling of The Hobbit. I may not be the biggest Tolkien nerd, but I am a huge fan. I may not own everything ever made for gaming in Middle Earth, but I own more than my fair share: I’m closing in on having a complete collection of Iron Crown’s Middle Earth Role Playing system, I have everything except the starter box for Decipher’s Lord of the Rings RPG (based off the movies) and have everything so far for Cubicle 7′s The One Ring RPG. I also own several different board games based off of Tolkien’s books as well as the co-op Living Card Game being made by Fantasy Flight Games. As far as GW’s products go, I didn’t bother with The Battle of Five Armies (I owned Warmaster already), but I’ve avidly collected GW’s Lord of the Rings Strategy Battle Game and have actively played it for years; I’ve made my own campaign system for their Battle Companies free expansion For LotR SBG, and I still think that GW’s War of the Ring game is one of the best miniatures games GW has put out (it is not without its flaws, but it remains one of the more satisfying games to play that GW has made). So when I start saying only bad things about GW’s The Hobbit game, it’s not because I’m a hater. And yet I was barely able to say one good thing about the Hobbit new releases in this issue. As a fan, I feel completely bent over the barrel by the stranglehold GW has on this game. The price-point of all the models is noticeably higher than the GW products many already consider “already too expensive;” the decent level of detail the models do possess is betrayed by their simplistic design (single cast, not multiple components and options that promote customisation) –which is only worsened by the fact that the quantity-of-product versus price-point ratio feels worse than anything else Games Workshop makes. So I guess that boils down to my Beef really is with this issue: that White Dwarf has me actively disliking GW’s Hobbit releases. The guy who defends The Hobbit movies being done as a trilogy; the guy who still points out that the sixth edition of 40k and the eighth edition of Warhammer Fantasy both have the War of the Ring game to thank for having their mechanics reinvigorated; the guy who still really wants to play more games of GW’s War of the Ring; the guy who’s planning on getting back into playing/running/GMing a role-playing game (thanks to The One Ring rpg) …or at the very least, to play more Middle Earth Quest and the Lord of the Rings living card game. Of all the hobbies I have been passionate about since my mid-teen years, it’s the Lord of the Rings I’ve liked the longest. It’s been one of my hobby mainstays for over twenty years now –I mean, I barely touch video games at all, and yet I’ve got a lifetime membership for Lord of the Rings Online. And here’s White Dwarf, on Games Workshop’s behest, convincing me to hate it. Just a quick post today, with many more regular updates to come on the subject. As many of you know, I have been buying up Forgeworld Horus Heresy minis like there’s no tomorrow. Dozens of infantry, couple tanks, Dreadnoughts, weapon packs, the whole deal. The retro aesthetics combined with top notch sculpting is just too much for me to resist. Collecting a pre-heresy (or Crusade era) army isn’t the same as doing regular old vanilla marines. For starters, you have to know what you’re getting into because everything is pricey and you can’t just pick these figs up from your FLGS. No, whatever goes into your list takes a lot more planning and patience (things I don’t always have in abundant supply). My Raven Guard Vigilator. Soon I will explain what that means; in the meantime, enjoy the pretty pictures! Hopefully this article series will help with that. I’ve got ideas mapped out for a handful of ways you can tackle the Horus Heresy as a gamer and collector. The cool part is that in some ways, I’m actually using these different strategies for different armies of mine. My Raven Guard, which I started in 2003, are getting random updates to make them fit the current edition of 40k and I’m throwing in models that can fit the Crusade list (such as Mr. Vigilator, above). The Word Bearers on the other hand are a full-fledged 30k army (a few MkIV test marines above, and a Cataphractii Terminator below). Virtually all resin, and purpose built for the army list instead of just being shoe-horned in. There will also be side projects full of Thousand Sons, World Eaters and Custodians. Looking forward to a chance to work on all those as well. Follow along with me! Watch the armies grow and my bank account shrink. I might even harass Mike for some updates on his Death Guard as well, I gave him a set of MkIII Legionnaires for Christmas so now he’s stuck. I’m such a good friend! Next article will be an introduction to the hallowed tome itself, Horus Heresy Book One – Betrayal. Your homework, class, is to fork over £70+shipping and get a copy for your self. See you soon, children. Building a Legion – New Post Series Coming Soon. We just had our weekend of the store’s Heavy Gear “Slow-Grow” league, and response was phenomenal! Sure, nine players sounds pretty small potatoes, but in a store that feels absolutely packed when there’s a dozen people playing miniatures games in the store, nine people is pretty awesome –especially for a smaller game like Heavy Gear. Heavy Gear League Journal: Week 1. Back at it again… LIVE STREAM!